Or should I say a small part of the pot collection! I don’t think Paul quite understood what I meant when we found this house together and I said I would be bringing a few pots along. He has this weird idea that if I bring a new pot into the house now then an old one should leave. I mean how ridiculous is that? I won’t tell you just now but I think I could if I needed to tell you where they all come from. The tall blue vase, middle, second shelf down Paul brought back from China when he was working out there. The gorgeous little squared salt glaze teapot under it is by Chris Weaver who we met in Hokitika, New Zealand. This entry was posted in pot collection. Bookmark the permalink. 5 Responses to A little bit of our cottage. The Man clearly needs some kind of help. could I make a few suggestions.1.Therapy2.a bit more Therapy.3.every time you bring a new pot in the house tell him you got it just for him, because he’s worth it4.just move them around , so he won’t be able to tell if a new pot has sneaked in.5. if he ever suggests such a thing again. have a few seconds lying around and start throwing them at the wall in a tantrum, ( it’s allowed your an Artist) then reach for one of His pot’s, and you will be suprised how quickly he shouts Stop! OK OK, you can keep the pots. Excellent thank you for the support in this matter, however my Paul thinks your suggestions Paul must all be tried and tested solutions to a similar problem! 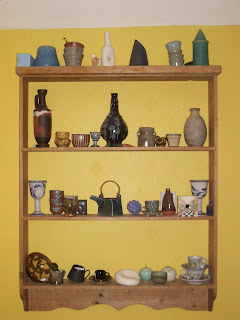 The bottom left is one of mine, it is from the first batch of pots I made during my apprenticeship. It is similar to one in another post but not the same one. The two small maholica tea cups on the bottom right are mine too from my apprenticeship, along with the bird whistle, the stack of tiny chun beakers and the rather wonky stack of anagama fired beakers on the top shelf. We have used the blue square teapot but at the moment it has a broken lid, it was Paul that did it but he was mortified poor man. It wasn’t part of the one pot out plan as he really likes that one too. That should say majoilca by the way.